From north of England M5 to junction 15 turn onto M4 (London). From M4 east exit at Bristol M32. From Wales follow M4 to M32 junction. Move onto M32 but come straight off, within 100 meters, at junction 1, turning left onto the A4174. This is the new ring road around Bristol and is a dual carriageway. Go through a set of traffic lights and bear left at the roundabout, stay on this road, signposted A4174 Bath / Keynsham and travel through a further 8 roundabouts. At the ninth roundabout turn left signed Bath on to the A4, continue on this dual carriageway for 2 miles to the next roundabout, taking third exit sign posted Keynsham. In ½ mile passing an Esso station on your left and the Talbot Pub on your right, to a small roundabout turn left on the B3116 (signposted towards the A39) continue on this road to its end. At the traffic lights at the T junction turn right on to the A39, follow this road for 1 mile and at the petrol station, the A39 bears left but you continue straight onto the A368. In about another 3 mile or so, you will come to the A37 roundabout, go straight across and in a further 3 miles you arrive in Bishop Sutton. **Entering the village** ignore sign to lake and take next turn right, Ham Lane (opposite the Red Lion Pub) and the site will be found 800 yards on your left. ON ARRIVAL PARK IN THE LAYBY ON THE LEFT OF THE DRIVE, DO NOT PARK IN FRONT OF THE ENTRANCE BARRIER, DO NOT ATTEMPT TO DRIVE UNDER THE BARRIER UNTIL YOU HAVE BEEN GIVEN THE CODE TO ENTER YOURSELF. 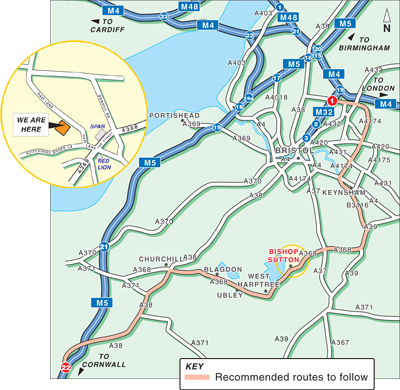 Follow the M5 to junction 22 and exit onto the A38 Bristol. Continue on the A38 to traffic lights at Churchill, turn right onto the A368 (Bath). Follow the A368, passing through the villages of Blagdon, Ubley & West Harptree & enter Bishop Sutton. Turn left after the hairdresser’s into Ham Lane, (opposite the Red Lion pub). Note that this is a very tight turn from this direction. Continue down Ham Lane for 800 yards (ignore the lane on your left) and the park entrance is then on your left. Many of our customers have reported that the route selected by their sat nav unit was not suitable for use with a caravan or motorhome. Caution is advised when choosing this method of route planning. For the latest travel news, visit https://roadworks.org/.